We buried Robin’s ashes yesterday in the roots of a black hawthorn tree out behind the Gumboot. As the tree went into the ground three eagles circled overhead, and it being Roberts Creek, a few lazy dogs and feral children wandered through the circle of held hands. Someone blew marijuana smoke from a fancy glass pipe through the branches. And then we walked up the road to the Hall which was filled to capacity with several hundred Creekers and friends and fans, who cried and told stories and sang Bobby McGee, and then laid on a generous potluck. Robin for sure would have laughed and loved it all, especially the many chocolate desserts. I met Robin some 15 years or so back when I was publishing a little bicycle magazine in Vancouver. She wrote me a letterâ€”by hand, back in the dayâ€” saying she had a sort of a farm on the Sunshine Coast, and was wondering if cyclists might like to come to visit. It could be, like, a sort of bicycle b&b. The only thing was, the road was muddy and up a steep hill through the woods of Mt. Elphinstone. And there wasn’t any electricity. And oh…the water wasn’t fit to drink…in fact, better not to advertise, since it was probably illegal for her to even live there, let alone take paying guests. But hey it was just an idea, and maybe I could discreetly spread the word. I thought that was curious, and filed it for future reference. Then I got a letter from her saying she was going away for a few days and would I like to come up and care for the farm and feed her rambunctious but lovable dog? I had never met her, or even been to the Sunshine Coast, and I had never lived outside of a city. I had no idea how to light a wood stove, let alone care for a farm. But Robin didn’t care. She just believed that somehow it would all work out, and she was never hesitant to ask for help â€” knowing that service is inherently satisfying, and would always be rewarded. I didn’t make it up to the Creek that time, but eventually I rode my bike onto the ferry and up the bumpy road. It was true, she did live deep in the woods, on a rented plot in a dark forest clearing up a steep and muddy trail. I brought chocolate, and we feasted on her famous eggs and potatoes with mayo. I pulled some weeds and cleaned the cluttered little kitchen, and she taught me the names of some plants. A couple of years later Robin seized the opportunity to buy a share of some rough land. She moved her farm from Flume Road to Pell Road, one concession over. She really did, move the entire farm. 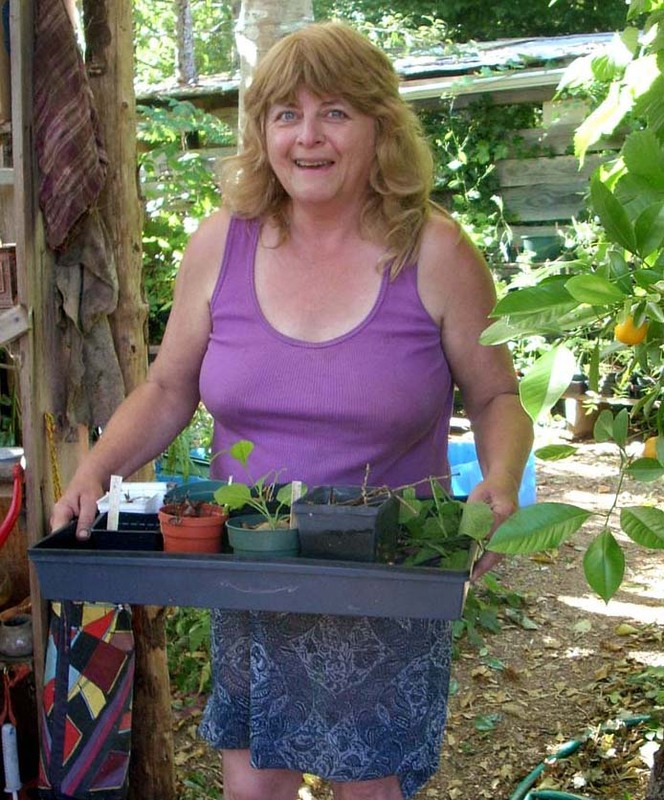 She dug up every last plant with her small hands and loaded the chunks of her houseâ€”a donated trailer and a couple of scavenged octagonal podsâ€”onto a flatbed, and moved it all, piece by piece. The new farm was basically a clearcut, and where the old spot had been dark and damp and enclosed, this one was vast and shadeless and dotted with piles of ragged slash. Some of the plants died. But she planted new ones, and little trees and bamboo for shade, and she dug a pond with a future beach for her lawnchair. She ran power lines and dug a murky well, and battled the local bureaucracy for permits and power. One night a winter storm knocked a big tree onto the house and she crawled around in the dark, avoiding live electrical wires until morning. Then she put out another call for help, and people came and brought tarps and wood. Through that long winter she boiled snow on the stove for water. In the spring she rebuilt the crushed room and she started again. Robin and I were like the country mouse and the city mouse. When she came to town I would give her maps and field frantic phonecalls for help finding bus stops, and I would take her out for tandoori and cheese cake. She would delight in the bustle of the city, and then scamper back to the woods. Then from time to time I would get to feeling crushed under the weight of my activism and my work and my day-to-day angst, and I would call her up. No matter how busy she was she always invited me to come, under strict directive to rest. I would promise to work on the farm but usually I would just separate some seeds or pick some berries, eating as many as went into the bowl, and then collapse on the front deck in the sun. And then I would make some dinner and wash the dishes, and Robin and I would stay upÂ late by the wood stove laughing and telling stories. I would listen to the silence, and the frogs at night and the birds at dawn. And then I would return to the city rested and refreshed and ready take up my own work with new energy. In all those years I never did manage to get Robin on a bicycle. And although she gave me lots of seeds, I never planted my own garden. No matter. We each did what we could do, with passion and zest, and we cheered each other on. Robin had big dreams. She imagined her chaotic little farm as a knowledge bank and a school. She imagined turning her hard-learned lessons and her stories into books that people would read. She imagined a new generation of young people who cared about planting seeds. 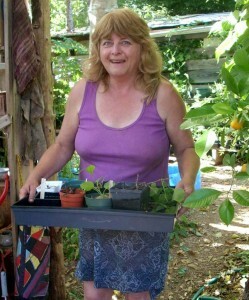 She imagined food revolutions and micro-farms in the city and pesticide-soaked lawns torn up and planted with potatoes. Only a few years ago all of this seemed so unlikely, and at times she would despair: no one understands what food security means. No one cares about organic food. No one is interested in farming. In dark and doubtful and lonely moments she would call me up and say, “can you please remind me why I’m doing this?” And all I could think to answer was, because it is important, because you love it, because you are making a difference. And she was. Little by little it all came to pass. Those radical notions of sustainability and personal responsibility caught fire and spread, and Robin became something of a celebrityâ€”not just on the Coast but in the city and around the world. These days I walk through East Vancouver and every other boulevard and traffic circle has been dug up and planted in garlic. My urban neighbours boast about their chicken coops. Robin’s muddy fingerprints are everywhere and the seeds of her faith are scattering on the wind, taking root and propagating like clover. More than anything what I learned from Robin was courage. She wrote books for the faint of heart because she knew what it was to be afraid, but she didn’t let it stop her. How can we be brave if we never face fear? But even though she had no money or partner or progeny she just kept putting it out there, inviting everyone to share what little she had, in some kind of wild faith. And it workedâ€”look Robin, it worked! When she died she was so rich in loving community, surrounded by family both blood and chosen, in the wabi-sabi paradise she built stick by stick. Robin didn’t live very long, but she did not squander one moment of her life. Robin’s ashes are buried under the roots of the hawthorn tree. May she always nourish the earth. Thanks for that Carmen. Robin was awesome. I barely knew her when she let me store my things under her trailer for 2 years while I meditated and couch surfed. I made her a rhubarb pie once when I cam e to visit and she always remembered that. I have both her books which are great. I didn’t spend that much time with her but still miss her. Oh and strawberry plants that I got from her are now this huge patch in my backyard. Beautiful, touching story, Carmen, and I’m so glad you shared your excerpt from this on Sunday. I still feel I have much to process, including the loss of such a dear friend and inspiring mentor. I’m looking for her in a series of particularly bizarre dreams I am having (includingtwo-headed deer, and dog-people! ), and I think she may be all around. Thanks for the portrait Carmen. You had invited me up to Robin’s place once and i never made it, but you just shared a very touching glimpse into why we do the things we do. Glad to have you back! Thank you Carmen. I don’t think I’ve even heard of Robin before, but I feel refreshed just reading this. What a wonderful friend to have known. I look forward to reading her books. Well, you shook my evening with this one. It’s such a beautiful portrait, memory-filled, joyful, and oh so real! thank you thank you thank you Carmen. Even Robin the writer, and Robin the militantly modest, would say you wrote that very very well and did her justice. I hardly knew her, having gone to supper at her place with my brother who was a good friend of hers. We hit it off though â€“ kindred spirits sort of thing, and it was one of the most delightful evenings I have spent since I returned to this country four years ago. What a shame she’s left us. May her spirit ever nurture the Earth she was so fully connected to and a part of. They should turn her place out there on the Sunshine Coast into some kind of memorial garden to her â€“ but not in the usual way that I don’t think she would have liked: care for the gardens she made only as much as is needed to maintain them and let the rest go back to nature. This was another wonderful piece of writing Carmen and evoked the life of this special woman in a deep, poignant and generous way. It’s so important to sing out the lives of such as Robin. Thankyou. I have a lovely photo of Coona, looking up the back porch stairs at Robin’s, waiting to go for a walk. Now they can, just like old times. I’ll have to dig that photo out and share it. I have lots of memories and lots of sadness about losing Robin. Mere weeks after my boyfriend died, Robin and her place offered solace, away from the pain. I was able to breathe for the first time in a long time. We made hot chocolate with the Grand Marnier she just couldn’t seem to get rid of. She gave so many of us a place to rest, in more ways than one. So many memories. God bless, Robin. Thanks Carmen, and thanks Rick B. for letting me know. Hugs Carmen. Wish I had been there for Bobby Magee. I remember hearing that she would be doing a workshop and thinking well I will have to go to another one later on. Guess later will never come now, but I do have her book so will see what I can figure out.